You had to know a part two was coming. I couldn’t very well call out my son for being “that kid” without admitting that I am “that mom”, right? I didn’t set out to be That Mom. None of us do. I know I’ve started numerous emails with, “I promise I’m not trying to be That Mom,” “Not to be That Mom, but…”, or just the blatant, “I’m not That Mom.” But it happened. I am That Mom. In the same way that we women often apologize more often than we need to, we seem to be terrified of being seen as or referred to as That Mom. As if we’ll send the PTO running for the hills away from us, the dragon lady who breathes fire and eats teachers. 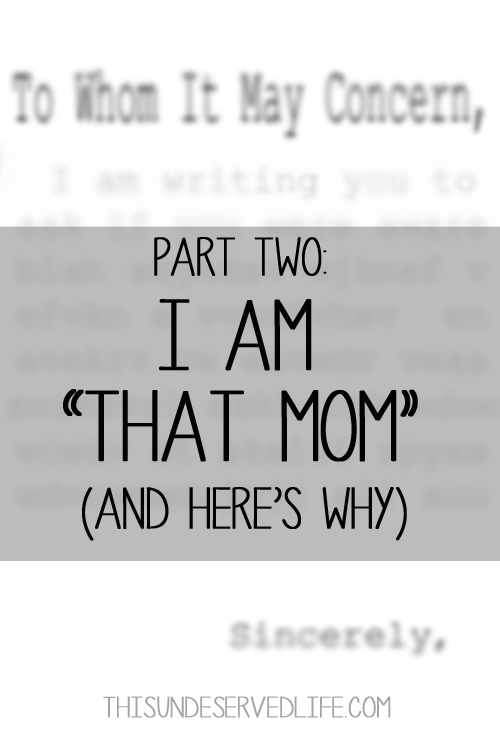 As if being That Mom were synonymous with being a Bad Mom. I am not one for confrontation. I’m not good at it, it makes me uncomfortable. I’m great at responding and reacting, but to confront an issue I must first dwell on it for a while, talk myself out of it a few times, ask friends to tell me any other way to get around it, allow myself to get flushed, hear my heartbeat, and probably cry from frustration. Once these steps have been achieved, I can now timidly approach confrontation. Why? Well, to be honest, most of the time it’s because I’m afraid of how I’ll be perceived. I want to be liked, and that’s as hard to admit as confrontation is to initiate. I like smiling and getting along with people. I want things to go well, and I don’t want to be associated with negative things or thoughts. But that’s just not life. Things happen and things have to be dealt with, and when you have That Kid, things happen and have to be dealt with more often. I’m not blaming my That Mom status on my kid. I didn’t become That Mom because of him, I became That Mom for him. Because he needs an advocate. Because he is a square peg and the round hole isn’t always a good fit. Because there are cracks in every system no matter how wonderful it is. Not because I enjoy arguing, not because I’m angry inside, not because I think he’s an infallible snowflake, not because I’m picking on anyone, not because I have it out for someone, not because I’m impossible to please, and definitely not because I’m a b word. Because the squeaky wheel gets the grease. Because I can either sit back and allow the cracks to swallow him, or I can speak up on his behalf. I am That Mom because he needs me to be. I am That Mom because I am HIS mom. My kids’ teachers are saints, before this is taken as a rant against anyone. They have wings and just about walk on water as far as I’m concerned. But they’re overworked, underpaid, and have their hands tied in an increasing number of ways. More often than not the situations where I speak up are situations where they cannot. I even had one angelic teacher thank me for using my voice and speaking up. Where school is concerned, there are a growing number of cracks for children to fall through. Class size, test prep, 22 different IEP’s, integration, transition time, finding ways to get PE time in during Spanish… schools are being choked more and more by legislation and requirements, and the teachers who volunteered to help shape our young people are often left with only the power to check boxes. Sometimes a need isn’t met, and I don’t blame the teacher, but that doesn’t mean our kids don’t deserve what they showed up for. So when it comes to school, I will take what he needs and leave the whispers behind. I will speak up for him and ensure that he is fought for, taught to, and included, no matter how it makes me look. Because I guarantee you that the stares and judgements and derogatory names will not matter or even cross my mind when I see him graduate. If the administration is breathing a sigh of relief to see him gone, so be it. We can speak up on political affairs, the management of our favorite sports teams, and pop culture, but not on behalf of our kids? That’s a big fat NOPE from me. No one else can be my kids’ mom – that privilege and work belongs to me alone. And if I don’t work harder on their behalf than I do at being liked I will have failed. Miserably. It’s not like it’s a source of pride. I don’t use “haters” as fuel or anything so dramatic. I’m not immune to the eye rolls and sighs and tension. I’m saddened each time I know I’ve blown a chance at a friendship by speaking up. I’m not out on a mission to get anyone fired, and I hate to think of anyone getting into trouble because of me. But I can’t let my timidity overrule my children’s needs. I can’t not stand up for what’s right just because I want everyone to like me. Ultimately it doesn’t matter if I make friends, it matters that they get what they need. Last year an issue arose where my son did not get what he needed, that middle kid of mine. It was a big deal, by anyone’s standards, and rippled out to affect others. So I showed up and did my work as That Mom. In this particular instance there really may have been steam coming from my nostrils, but I didn’t eat any teachers and I wasn’t on the news, so we’ll call it a win. I knew the exact moment I was trading in “I love that mom!” for “Oh, she’s That Mom, ” but I could either back down and try to make a friend at my son’s expense or hold someone accountable. He needed what he was promised. A few months after, a friend of mine saw me at the store and asked me about it. I was quite surprised, as I hadn’t advertised it or vented publicly. Somehow, though, as will happen, some person shared some version of it, and the gossip mill got to work grinding out sensational tales of Jennifer the Whip-Wielding Crusader Mom. That’s not really word-for-word, but it was quite a story. To be honest, I was first surprised that anyone even knew who I was to share the story. That meant that I could no longer go incognito at pickup and show up makeup-free in my sweats, hoping my messy hair was going unnoticed. Dang. If people know who I am enough to share stories about me, they’re going to see me when I show up. Now I have to wear pants with a zipper. Ugh. My next reaction was one of embarrassment. What must these people think of me? I bet they’re hoping they don’t get a class with any of my kids! Do the kids’ teachers know the true version of what happened, or are they going to cower when I walk in to Meet the Teacher? What do people think?! Eh, it doesn’t matter. If they think I’m a crusader, awesome. Maybe it will empower them to speak up on behalf of their kid. Maybe they’ll approach me with suggestions and energy about how to fight for change in the system. Or maybe they’ll just be scared of me and let me sit in peace in my sweats in the pickup line. Either way, their opinion didn’t matter. They definitely formed thoughts, judgements, and gossipy tales, but it didn’t affect what my son needed or what he got. They’re going to talk. I can’t control what they’ll say about me. But I can control how my son will remember me fighting for him. Which leads me to the main, ultimate, single most important reason I am That Mom. Last week that same middle kid (it’s always him) took a fall at school. It was a total accident, but he hit his face HARD on the floor – chipped tooth, lots of blood, and we later found out a broken nose. He was glassy-eyed, irritable, and very tired, so I took him to the emergency room just to be safe. When the doctor came in, she spent less than 3 minutes with him – checking his tooth, checking his tongue, feeling his broken nose and telling him he could go home. I know I’m not a doctor, but it seemed a bit rushed and incomplete, knowing we were there for a possible concussion. My son was as surprised as I was. Maybe surprised isn’t the right word – he was angry. “That’s IT?” he asked, completely incredulous. “You’re not going to check me or anything?” The doctor, bless her, didn’t know this boy or the IQ he walked in with. She assured him he was fine, which only ruffled him more. “I’m not fine, that’s why I’m in here.” She asked if maybe she had used some words that he didn’t understand, which seemed to add fuel to his fire. “I understood everything you said perfectly, which is why I’m upset.” We were a printout away from being discharged, and here he was, speaking up in a room full of adults, advocating for himself. Sure we can work on his delivery, but the bravery it took was still incredible. I had tears in my eyes, not from embarrassment – from pride. This little boy wasn’t trying to put anyone in their place, he wasn’t trying to be disrespectful, he wasn’t trying to prove anything, he was only trying to get the care he needed. And he knew what to do in a situation where he felt he wasn’t being heard – he spoke up. Speaking up eventually led to him getting a CT scan, which it turned out he needed. If he hadn’t advocated for himself, I don’t know what would have happened. He has seen me fight for him and now knows that he can fight back, too. He knows that if something isn’t right, you can say something. Then say something else. And keep saying something until someone listens and it gets made right. He’s only 8, so I don’t think my job is quite done yet. I’m not trying to protect my kids, I’m trying to equip them, and sometimes it takes losing a popularity contest to do that. I know I’m not alone, know there are a lot of others out there doing the best they can for their kids at the expense of their image. High-five, Momma. Parenting is hard, and parenting to cater to everyone else’s opinions is impossible, so let’s stop apologizing for advocating and get our kids what they need. It doesn’t matter what they call us – That Mom, Tiger Mom, Mama Bear, Helicopter Mom, Room Mom, Team Mom… it only matters that we are a good mom. Cheering for you that you stand up for your kids every day. Cheering for your son for standing up for himself and learning from the best mom (and dad) he could have!